A spanner is a small hand held tool with a fixed size. Spanners are designed to loosen or tighten nuts or bolts. 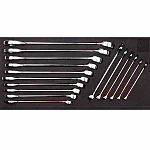 Spanner sets offer a selection of different spanners as a kit. These sets are often supplied in a box, case or foam tray. 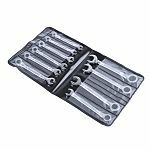 The number of pieces within in a spanner set can range from two or three pieces up to fifty or more. 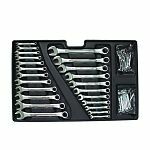 Spanner sets tend to contain the same type of spanner (e.g. ratchet or combination spanner) but in varying sizes. Imperial spanners use the AF (across flats) system, where the measurement is taken between two parallel sides of the fastener. A inch spanner will fit a inch fastener. The metric system is different and the sizing system refers to the size of the thread rather than the size of the head of the fastener. Common sizes include M6, M8, M10 and M12. The M prefix is short for metric while the number indicates the width of the threaded section. For example, while there can be a few variations in mm, you would normally see a 10mm spanner being used for an M6 fastener.